The Richard Bland College Honor Code covers both academic and non-academic actions. 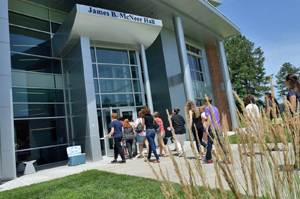 The Honor Code at Richard Bland College is a democratic system of government that is upheld and supported by students, whose democratic efforts are actively supported by the administration and faculty. The letter and the spirit of the College’s Honor Code promote the virtues that sustain a democratic society, such as integrity, social responsibility, and moral courage. As a branch of The College of William & Mary, which introduced the Honor System into American higher education, Richard Bland College commits itself to the perpetuation of high standards and expectations of its collegiate community. With an aim of educating individuals, the Student Conduct Board shall not discriminate in its membership or in its dealings with the accused on the basis of race, color, religion, national origin, gender, gender identification, sexual orientation, economic status, veteran status, disability, or any other status protected by law. All applicants to Richard Bland College must sign the following pledge: I have read the Honor Code of Richard Bland College. I understand completely what is expected of me under this code. I know that any act of lying, cheating, plagiarism, or stealing of an academic nature is a violation of the Honor Code. I hereby pledge, without reservation my full support of the Honor Code. I have read the Honor Code of Richard Bland College of William & Mary. I understand completely what is expected of me under this Code. I know that any act of lying, failing to disclose an Honor Code violation, stealing, or cheating is a violation of the Honor Code and will subject me to disciplinary action, which could result in expulsion from the College. I hereby pledge, without reservation, my full support of the Honor Code. A student violates the Honor Code if the student engages in dishonorable conduct as defined below. All Honor Code violations will be referred to the Student Conduct Board, and if necessary, a hearing will be conducted following the Student Conduct Board Process and Procedures. Students who commit academic Honor Code violations are subject to grade sanctioning by the course instructor and a hearing before the Student Conduct Board, following the Student Conduct Board Process. The Honor Code will be applied reasonably in accordance with the examples below. Examples of proscribed conduct are meant to be instructive and not all-inclusive. Providing false or misleading information to Campus Police or to Student Conduct Board members or investigators during the course of an investigation or hearing of an alleged violation of the Honor Code or Student Code of Conduct or during an investigation involving discrimination, harassment, sexual misconduct, or retaliation. Lying within this context may be charged as a separate offense. Providing false information on a Richard Bland College application. Stealing: knowingly taking or appropriating the property of another, including property of the College, without the rightful owner’s permission and with the intent to permanently or substantially deprive the owner of the property. One does not receive rightful permission if it is induced by fraud or deception. Plagiarism: the presentation with intent to deceive or with disregard for proper scholarly procedures of a significant scope, of any information, ideas, or phrasing of another as if they were one’s own without giving appropriate credit to the original source. One commits plagiarism when one includes the words of another without quotation or when one includes the substantive work of another without properly crediting the source with footnotes, quotation marks, or other appropriate citation. A student’s intent may be inferred based on the extent and context of the improperly cited material and whether the student has provided false citation or has manipulated the original text such that a reasonable person may conclude the student did so in order to avoid detection. Disregard for proper scholarly procedure that is minimal in scope may be addressed solely as an academic matter, and the instructor may determine whether an academic penalty should be applied without pursuing resolution under the Honor Code. But any intentional acts of plagiarism or disregard for the scholarly procedure of a significant scope shall be treated as a violation of the Honor Code. Unauthorized Assistance/Collaboration: giving unauthorized aid to another student or receiving unauthorized aid from another person on tests, quizzes, assignments, or examinations. Unauthorized assistance includes, but is not limited to, providing information to another about an assignment or examination prior to the conclusion of the administration of such exams/assignments to all related sections of the course unless permitted by the instructor. Use of Unauthorized Materials: using or consulting unauthorized materials (including electronic materials) or using unauthorized equipment or devices on tests, quizzes, assignments, or examinations. Unauthorized Dual Submission of Previous Academic Work: using any material portion of a paper or project to fulfill the requirements of more than one course unless the student has received prior permission to do so from the appropriate instructor(s). Time Constraint Violation: intentionally commencing work or failing to end work on any examination, test, quiz, or assignment according to the time constraints imposed. Directions Violation: failing to follow instructions for an assignment or examination despite knowing or having reason to know that such conduct would result in an unfair academic advantage. Failing to disclose that another student has committed an Honor Code violation. In matters involving grade appeals, including academic violations to the Honor Code, the student should consult with the faculty member who issued the final grade for the course or assignment. If the student still believes a grade has been assigned unfairly, the student may appeal to the Department Chair and further to the Provost. If the issue cannot be resolved at any of these levels, the student has the right to appeal formally to the Academic Standards & Appeals Committee. This written appeal must be submitted within ninety (90) calendar days of issuance of the student’s final grade. A form for facilitating the appeal process is available in the Office of the Provost. It shall be the responsibility of the Academic Standards & Appeals Committee to hear the student’s grade appeal and to interview anyone the student chooses to speak on his/her behalf. The faculty member issuing the grade also has the right to appear before the Committee for the purpose of presenting pertinent information and also may have witnesses present if desired. The recommendation of the Committee will be reported to the Provost, who will make the final decision and notify the student. The Committee is not empowered to change a grade. In these proceedings, the burden of proof is on the student to prove that a change of grade is the appropriate action. For misconduct involving student or employee discrimination, harassment, sexual misconduct, or retaliation pursuant to Title IX, please refer to the RBC website at Discrimination, Harassment, Sexual Misconduct, and Retaliation Policy for applicable policies and procedures.